Remember how much fun it was, when you were a child and played with paper airplanes? Pilot turned inventor, Shai Goitein remembers, and he wants to share. Shai is responsible for one of the most unique UAVs I’ve seen to date. The product, PowerUp 3.0, is developed by PowerUp Toys after a successful KickStarter campaign. This is an awesome product for a company that was just founded in 2011. That being said, I’m not really sure how to categorize it, I think the closest match would be a “fixed-wing” drone? 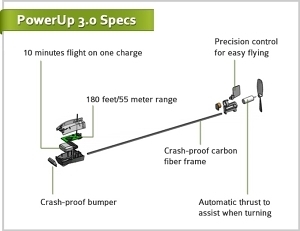 What is the PowerUp 3.0? Its the third evolutionary step of “the world’s first remote controlled paper airplane conversion kit.” In just a few steps (see below), you can easily convert any paper airplane into a remote controlled paper airplane that you control using with your smartphone. Charging is easy too, it uses a common micro USB cable. This STEM oriented toy even comes with a spare propellor and rudder. With the need for funding and backers, the company turned to popular crowdfunding site Kickstarter, raising an outstanding $1.2 million dollars. Its durable, crash proof design makes it an easier and more enjoyable option to traditional, bulky and battery intensive remote control helicopters and planes. 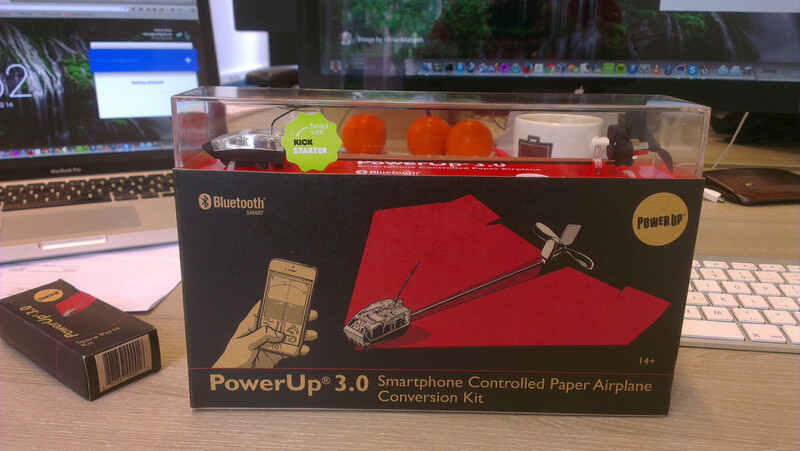 The PowerUp 3.0 Bluetooth, Smart Module transforms ordinary paper planes into motorized machines, controllable directly from your smartphone. It’s also an educational experience — PowerUp 3.0 meshes origami, physics and incorporates all the components of STEAM, (Science, Tech, Engineering, Art, Math). This unique combination allows for schools and teachers to educate students on the basic principles of flight, aerodynamics, and lift. With 180 feet/ 55 meter range, and 10 minutes of flight time capability, PowerUp 3.0 is the first choice in flight. “This is a neat crowdfunded project I backed a few months ago that delivered! Powerup Toys has been making kits that add a battery powered propeller to paper airplanes. 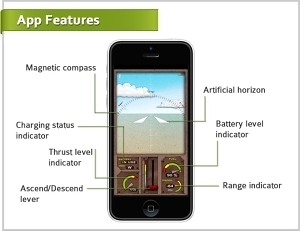 In this new 3.0 version, they have added the ability to control the plane with a smartphone. Even though the KickStarter campaign has ended, you can still visit the old KickStarter campaign homepage for some interesting product information. 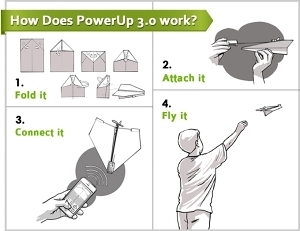 PowerUp 3.0 turns your self-made paper airplane into a smartphone-controlled flying machine.